Elder (Danny) Furr got transfered to Dartmouth, Nova Scotia this week. Dartmouth is where the mission office is headquartered, along with the Halifax Nova Scotia Temple. Elder Furr reports that he is excited about this transfer because he'll be rooming with the office Elders and looks forward to learning from them. 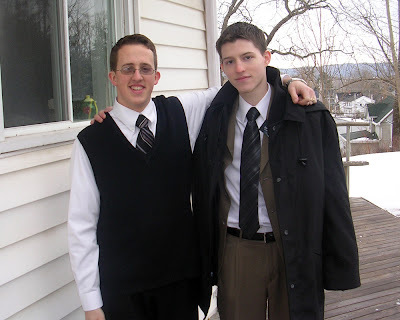 Below is Elder Furr (right) with his companion from his previous area. 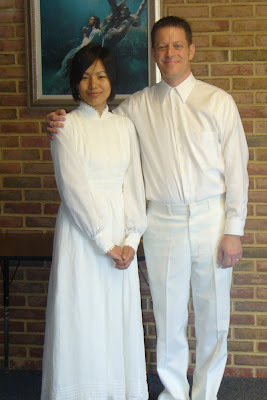 Speaking of Elder Furr, last Saturday Patricia (Danny's pre-mission girlfriend back in Pennsylvania) was baptized. Below is a picture of Patricia with Larry's mom. Patricia moved with her family to the United States from Burma when she was 14. Here is Patricia in her baptismal dress with Larry's dad, who baptized her. 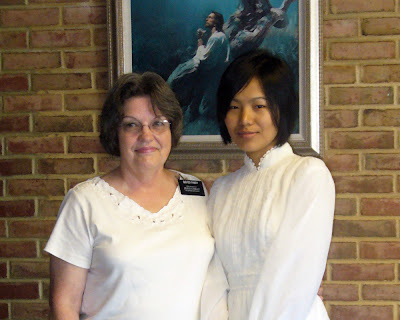 This is Patricia with one of the sister missionaries that helped her prepare for her baptism. We congratulate Patricia for taking this important step in her life. Thanks Larry for posting up those baptism pictures. They look nice. I am so gald to be a member of the church after all. it is great. We do seem to have a knack for that.